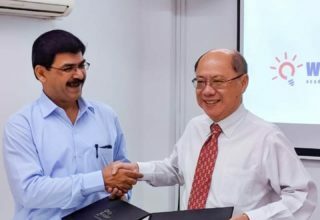 "We are thrilled to take a leap into the next league of global education by associating with Orita Sinclair, Singapore"
Orita Sinclair, Singapore – a pioneer institution offering industry-driven courses that provide theoretical and practical foundation for students to successfully meet the demands and challenges of international design industry. 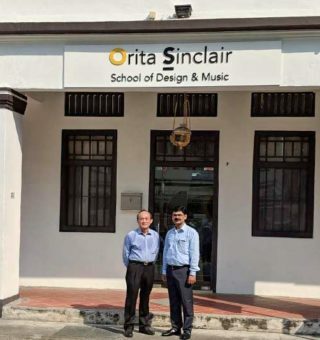 Orita Sinclair School of Design & Music is one of the most desirable design schools in Singapore. 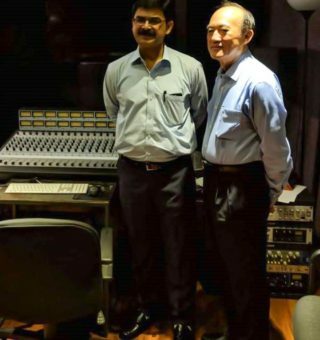 It is helmed by industry leaders and its teaching staff are award-winning designers and artists. 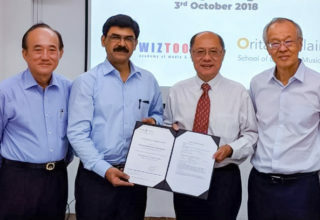 The Memorandum of Understanding was signed at Orita Sinclair, Singapore on 3rd October 2018 with Mr. Tan Hup Foi, Chairman, Mr. Foo See Meng, Chief Executive Officer and Principal, Mr. Tay Eng Hoe, Director (Orita Sinclair) and Mr. Sreedhar V T, Founder / Chief Executive Officer of Wiztoonz. This association is going to facilitate Indian students with an easy road to complete their education abroad by pursuing the brand-new Design Programs at Wiztoonz!